American Lock solid aluminum padlocks are made from an exclusive aluminum alloy, offering strong protection against the elements. Most aluminum padlocks have hardened boron alloy steel shackles for superior cut resistance, and are chrome plated for extra corrosion resistance. The non-serviceable five-pin APTC12 cylinder can be factory keyed to your requirements. Rust-resistant brass shackles are available as an optional upgrade for corrosion resistance in harsh outdoor environments. 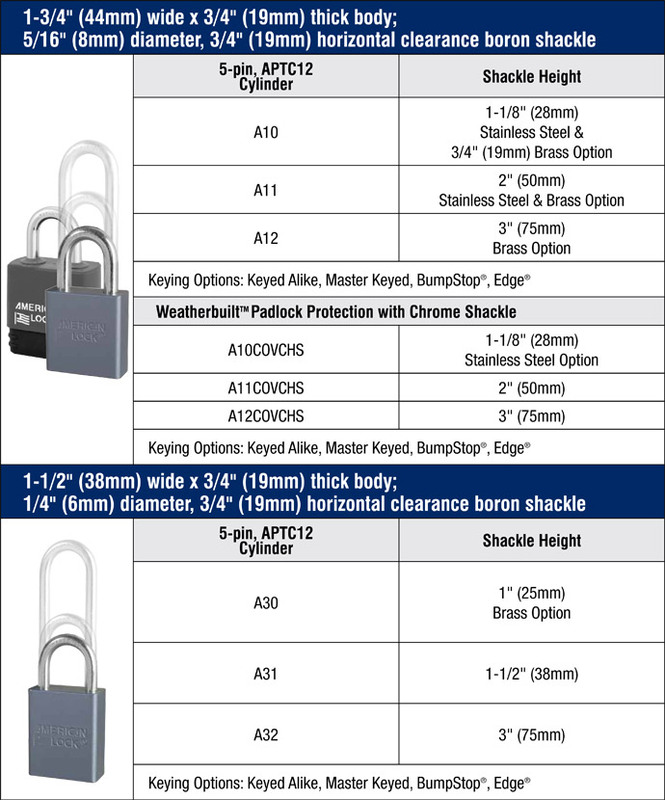 Weatherbuilt™ Padlock Protection is available, with the added optional upgrade of stainless steel shackles for the best combination of corrosion- and cut-resistance. Includes A10, A11 and A12, with specifications listed below. Includes A30, A31 and A32, with specifications listed below.